1. Concerning the Person: My name is Karpanus Miriam, born [Miriam] Krawiec, [I was] born in Wladimir-Wolynsk, Poland, on 12/29/1922 and now live in Jaffa, 42/30. 1. Concerning the Facts: I remember Mr. Kisel Goldberg (Cziel) from the time before the war in our shared hometown of Wladimir-Wolynsk. The Germans invaded the city in 1941 and immediately began implementing severe anti-Jewish measures. We had to wear a white armband with a blue Star of David, which was later exchanged for yellow stars on chest and back, and we had to perform arduous forced labor, guarded by German constabulary, SS, and Ukrainian militia. I worked cleaning streets, laying cables and doing farm labor, and Mr. Goldberg was forced to do heavy lifting in the transport crew. Entering certain parts of the city was forbidden, and exact curfews were imposed on the Jewish population. Early in 1942 the Ghetto Wladimir-Wolynsk was surrounded by an entangled fence and heavily guarded day and night by SS and Ukrainian militia. It consisted of a few narrow, old side alleys, where about 30,000 Jews had to live in indescribable confinement. There was a Jewish Council, under the leadership of Kudisch, which distributed the meager food rations. 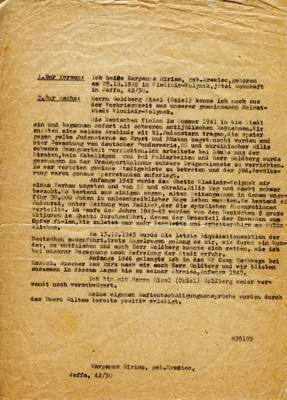 During the course of the year 1942-43 2 large actions, to which most of the inmates fell prey, were conducted in the ghetto by the Germans, until finally only experts and people who were able to work remained alive. On 12/13/1943 the Germans' last liquidating action was conducted. Although it was raining bullets, I managed to escape as if by a miracle, and Mr. Goldberg was also able to save himself, as I found out when we met after the city's liberation. At the beginning of 1946 I ended up in the Displaced Persons Camp Eschwege near Kassel. Mr. Goldberg arrived there, too, soon after I did, and we stayed in this camp together until his departure in early 1949. I am neither related to Mr. Goldberg by birth, nor by marriage. My own claims toward compensation for my detainment have already been settled through the office of Miltam. 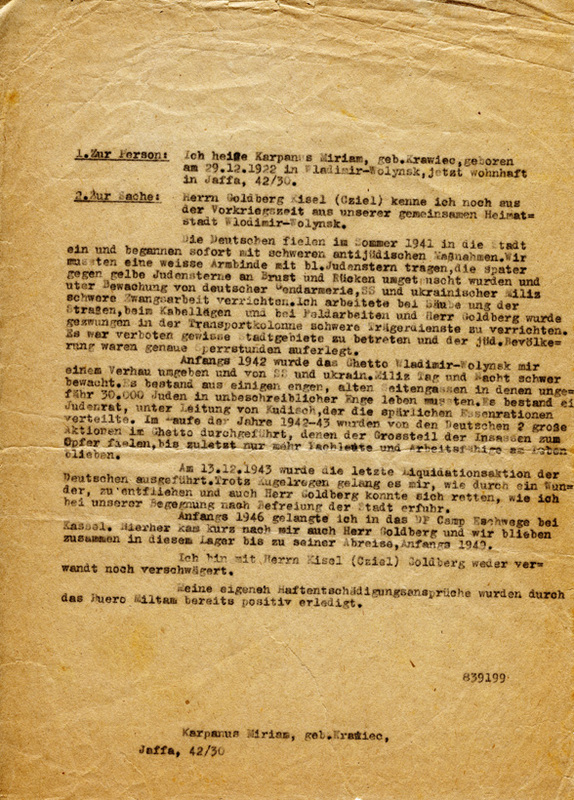 An affadavit from Miriam Karpanus attesting that Kisel Goldberg was forced by the Germans to perform hard labor and that after the war he spent time in camp Eschwege near Kassel. A translation of this affadavit is to the right.